Kim Griffith is a life long resident of Williamsburg, Virginia with over 35 years of experience in new home construction and remodeling. She also co-owned D.A. Griffith Builders, Inc. for 18 years. Her hands-on approach during that time lead the successful residential building company to it’s retirement. At the point of their retirement she was proud of the accomplishment of over 200 homes built, 99 of which were in the Ford’s Colony neighborhood. Kim has been building and remodeling for native “Burger’s” as well as for clients moving in from out of the area (D.C., New York, New Jersey, PA, Ohio, Maryland, Texas, etc…). 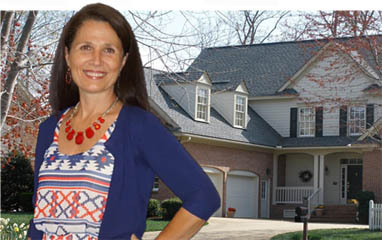 Whether moving here for retirement or looking for a more rounded lifestyle to raise their families, Kim makes it very easy for her customers to build long distance. With minimal trips required during construction, she saves her customers time and money. Currently, with the upswing in new construction, Kim is pursuing her passion by talking to perspective customers about building their new home. Keep an eye out for Kim’s blog that will follow her new projects. For the past several years Kim has been fulfilling her passion with remodeling projects. She can take a dated house or room and create the changes necessary to provide a wonderful, functional, timeless space that her clients love. Updating is a vital part for resale and also for the pure enjoyment of your home. A home may not be poorly built or designed but feel old and outdated as time goes on. A new face to a great space can be just what the doctor ordered. Kim’s creative eye for finding “extra” space for a room is a huge value for remodeling too. Sometimes my clients need my seasoned eye to see what can be done to give them what they are looking for. Remodeling is so much fun and very rewarding for me. I love to see my clients beaming with excitement and appreciation when the plan comes together. Kim has built Kimberly Builders, Inc. to model the scripture “A good name is better than riches and gold”.